A few years ago, I did a little something for the Food Network. They had a series called “Calling All Cooks” and I reached out to them. I was surprised when they called me back and told me they wanted to do a show featuring some of my recipes. 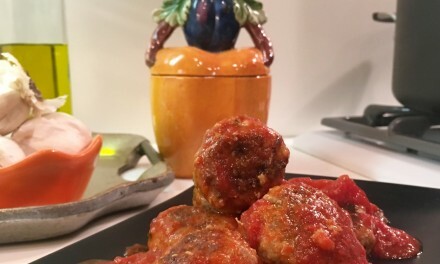 One of the recipes the Food Network chose was my grandmother Angela’s signature dish, pasta piselli, which is pasta with a sauce of peas, cauliflower, tomatoes, and garlic. The other recipe they wanted me to do was shrimp with pesto. 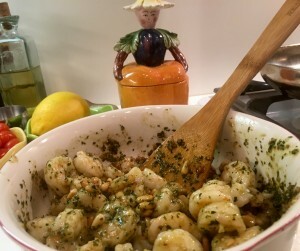 I’d done pesto recipes before; I’d done shrimp recipes before, but I never did a shrimp with pesto recipe. 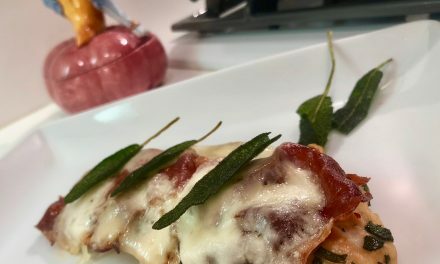 I told the Food Network people I didn’t think the recipe would work, because Italians don’t normally use cheese with seafood, and pesto sauce has Parmigiano-Reggiano and Pecorino Romano cheeses in it. They told me to make it anyway. They were adamant about it. My first instinct was to tell them to go jump in a lake. But…maybe they were on to something. So I put my big head aside, and tried it. We decided to shoot the episode at my uncle Oscar’s house, on a river outside of Baltimore, Maryland. Oscar and I were really close, he taught me more about cooking than anyone. 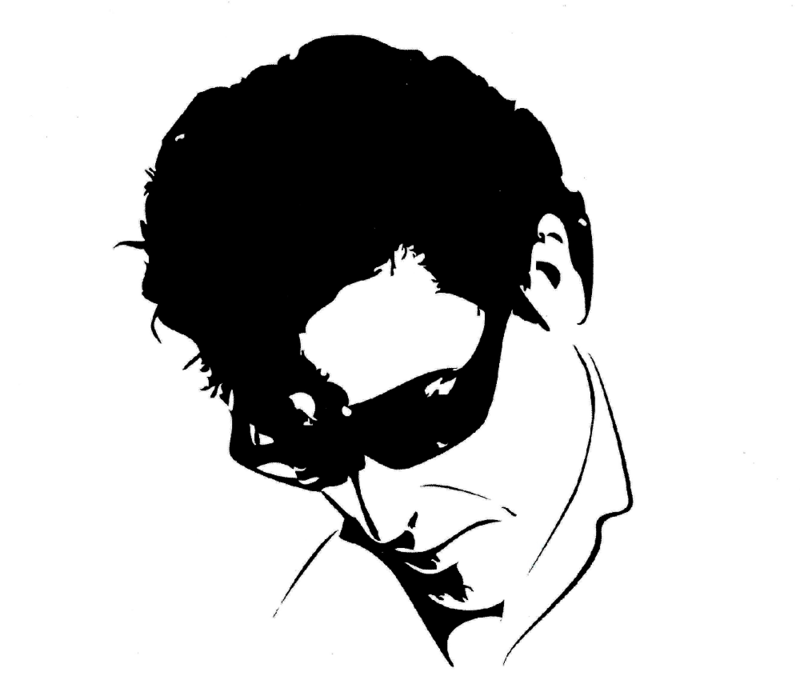 He had great skills, and a wonderful kitchen. The Food Network then asked if I could get the Slim Man band to join me at the end of the show for a little taste, and a quick song. Getting the band to set up all the equipment was out of the question, so I ended up playing guitar and singing as the band sampled the shrimp with pesto on Oscar’s back deck, overlooking the river. The shrimp with pesto turned out great. 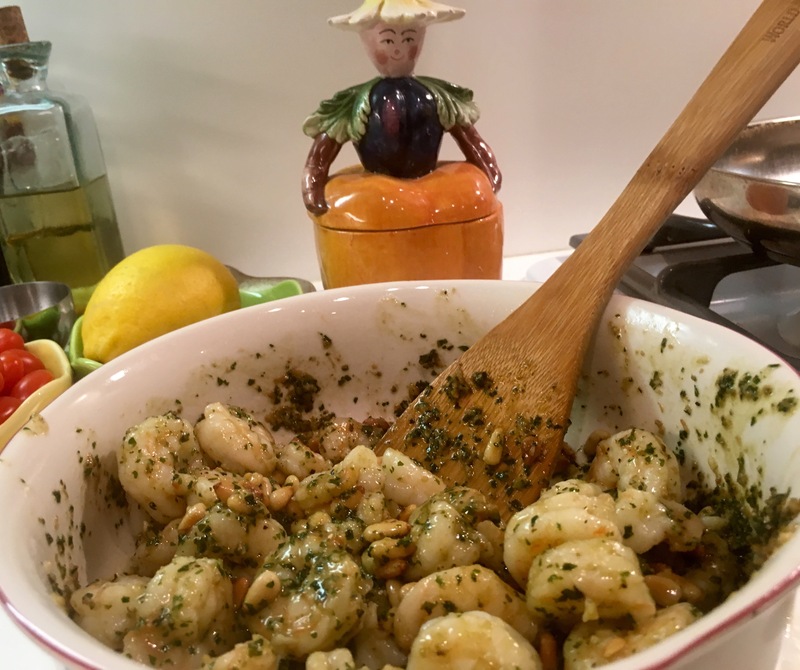 Last week, I was thinking about that day at Oscar’s, and the shrimp with pesto. I decided to try and make it again, to re-create the dish I’d done a few years ago. But this time, I decided to add a little Slim Twist. I added toasted pine nuts to the final dish. I had made a batch of pesto; I broiled some shrimp, and put it in a bowl with the pesto and some toasted pine nuts. Wow, it was good. I served it with some warm, crusty bread, and she was a so nice! It was so good, the next night I made it again and put it over some spaghetti. It was delizioso. So here is the recipe. It’s easy and quick and scrump-diddly-umptious! You can use my most excellent pesto sauce; the recipe is in the Slim Man Cooks cookbook. I used wild-caught shrimp, de-shelled and de-veined. I’ve tried farm-raised shrimp, and I don’t like the way they taste. They’re mushy and bland. Mushy, I tell ya! 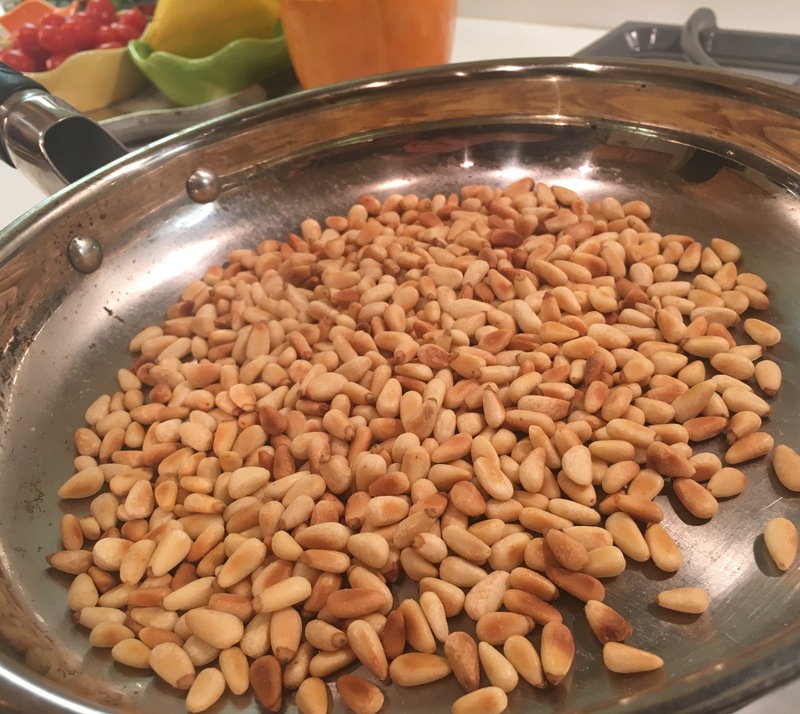 To toast your pine nuts, put a small sauté pan over medium heat. Add your nuts, give ’em a shake every 30 seconds or so. Don’t burn your nuts. I burn mine frequently. Keep your eyes on these guys. When they’re golden, put ’em on a plate. 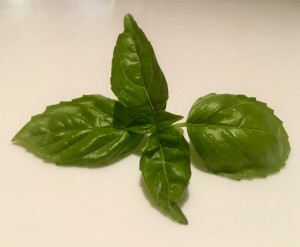 My pesto sauce is quick and easy. It only takes a few minutes, Slim People. You can do this. If you want to use a store-bought pesto sauce, I will forgive you—just this once! I’ve included my pesto sauce recipe, just in case you want to see how easy and delizioso it is. In a small sauté pan over medium-low heat, add a tablespoon of olive oil. Add the garlic, and sauté on each side for a minute or two; remove from heat. 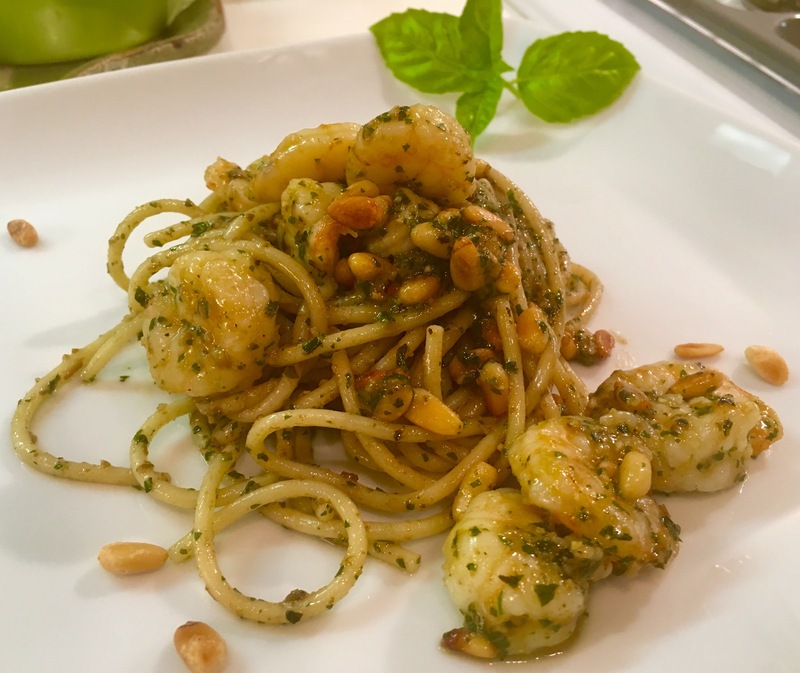 Put the garlic and its olive oil, the basil, ½ cup of olive oil, 4 generous tablespoons of the toasted pine nuts, and the ½ teaspoon of salt in a blender and blend, baby, blend. You can also use a food processor. When everything is smooth, transfer to a bowl, and slowly blend in the grated cheeses by hand. Or better yet, use a spatula. 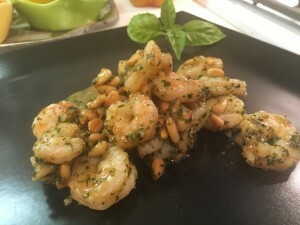 Use the remaining toasted pine nuts (1/3 cup or so) for the shrimp. Put the shrimp in a bowl. Add the olive oil and mix. Add some salt and pepper and mix. 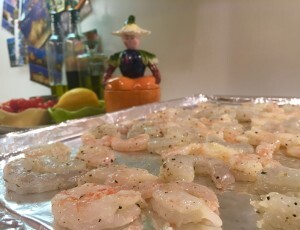 Place the shrimp in a single layer on a baking pan lined with aluminum foil. Place under the broiler for 4 minutes. Keep your eyeballs on these guys! Don’t go burning your shrimp! After 4 minutes, taste a shrimp. It should be done. If it ain’t, cook for another minute or so. When the shrimp are done, put them in a large bowl. Add a generous 1/3 cup of pesto sauce. 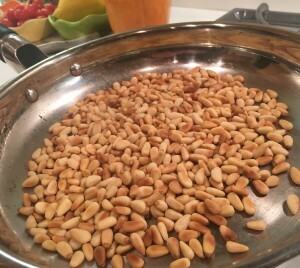 Add the remaining 1/3 cup of toasted pine nuts. 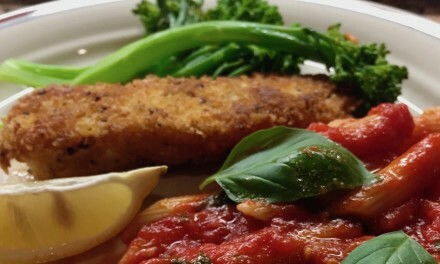 Serve with warm, crusty bread, or you can serve it over pasta. Cook a ½ pound of pasta (spaghetti or linguine) according to the instructions. 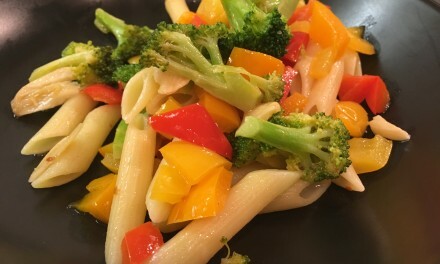 Put the pasta in a large bowl, drizzle with a tablespoon of olive oil, and mix ‘em up. 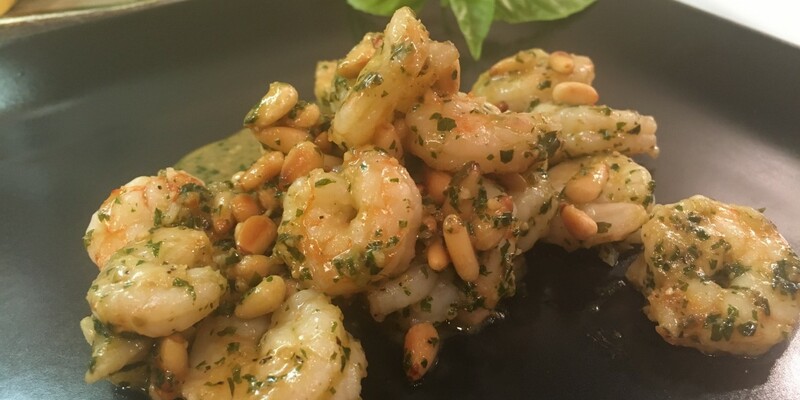 Add the shrimp with pesto and pine nuts.